27 Votes Please vote for the Quality of this Port / Wrapper, not for the Game or Application! 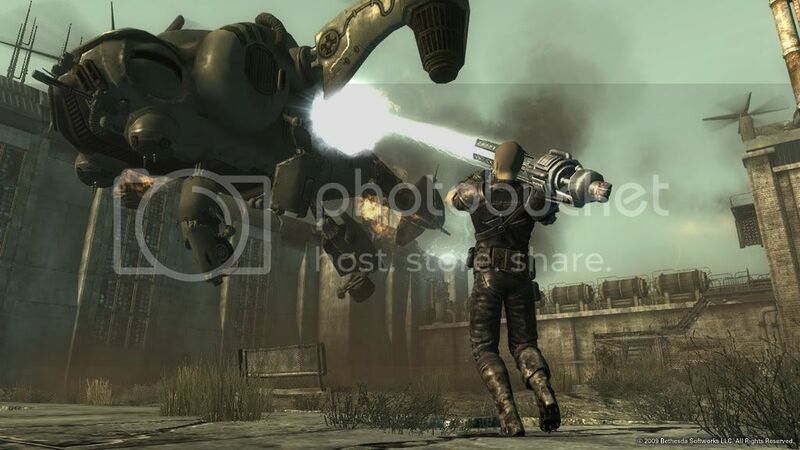 Tale of Two Wastelands (TTW) is a project that seeks to merge the content from the popular video game Fallout 3 into the more modern game engine of Fallout New Vegas so that both games can be played in the Fallout New Vegas engine. 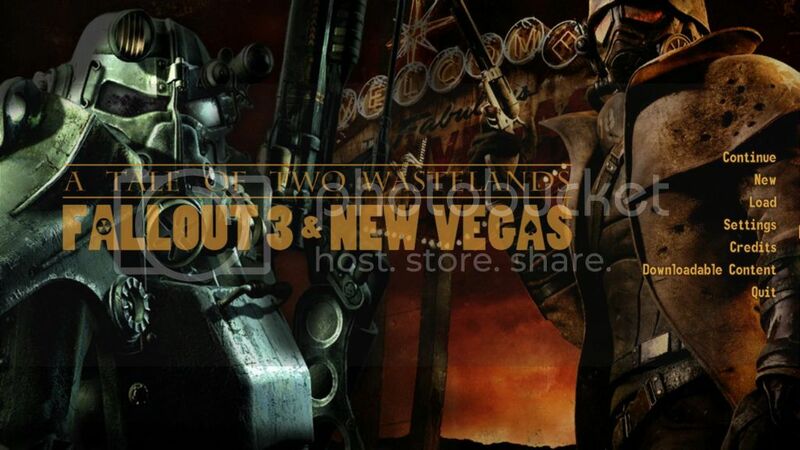 Tale of Two Wastelands is the successor to the Requiem for the Capital Wasteland (RFCW) project. Many of the team members are the same, and the goal is the same. You can't download Requiem for the Capital Wasteland here (nor anywhere else really), and you won't find any discussion of it here. At this point, Requiem for the Capital Wasteland is outdated anyway, as many improvements have been made in the latest version of Tale of Two Wastelands. Pirated versions of Fallout 3 GOTY and Fallout New Vegas Ultimate Edition will not work with this mod. The game requires either the retail versions of both games fully updated or the Steam version, in which case the user will have to install Steam into the wrapper via Winetricks. The Tales of Two Wastelands wrapper has been the result of a couple months of work towards configuring a wrapper to support the TTW project. Originally, this project was only able to support transferring files from a Windows installation into the TTW wrapper but thanks to the new Wine Staging, MS DotNet 4.5 now successfully installs in a 64bit environment which is required by the Tales of Two Wastelands installer due to unknown failures during installation into a 32bit environment previously. Additionally, some Fallout - A Tale of Two Wasteland mods have been added to tho wrapper for user easibility. These mods include ttwfixes_2_2_2.fomod[/1] which are a few fixes that were introduced after the latest release, The Mod Configuration Menu.fomod which is required when accessing the extra TTW options, and TTW_zhetas-title-cards.fomod which gives the introduction to A Tale of Two Wastelands a more personalized feel towards the project in general. TTW Alternate Start.fomod is used if you would prefer to start Fallout A Tale of Two Wastelands in the Mojave instead of the DC Capital state. Project Nevada, Project Nevada Additional Options and Project Nevada TTW. TTWProject Beauty has also been included. This mod is an NPC and character creation overhaul mod. Lastly, TTWRedesignâ€¦however I would not suggest using this mod if you have less than 1024MB of VRAM. This wrapper requires manual clean up procedures after the installation is complete which will clear up roughly 15GB of wasted space. These instructions can be found in Installation instructions below. The main game folder contains four apps and an extra folder containing useful files after installation has completed. FNV Edit.app [15.9MB in size] is used when applying mods to the installed game. It will verify that none of the mods are conflicting each other. If a conflicting occurs FNVEdit will fail and proper instructions will tell you what mod needs to where in the load order. After you have made the adjustment using FOMM run FNVEdit again until it successfully builds the cache. - about 45GB Hard Drive Space during the installation process and finalized at 28GB HD Space post installation clean up. Once all steps have been followedâ€¦.Enjoy! If the launcher app being used does not launch correctly it is due to a reset of certain registry files. This is an easy fix. Right click on the Fallout A Tale of Two Wastelands.app and choose Show Package Contents. Follow the path Contents > Resources and copy system.reg, user.reg and userdef.reg and paste them into the same location of the app launcher that does not work. 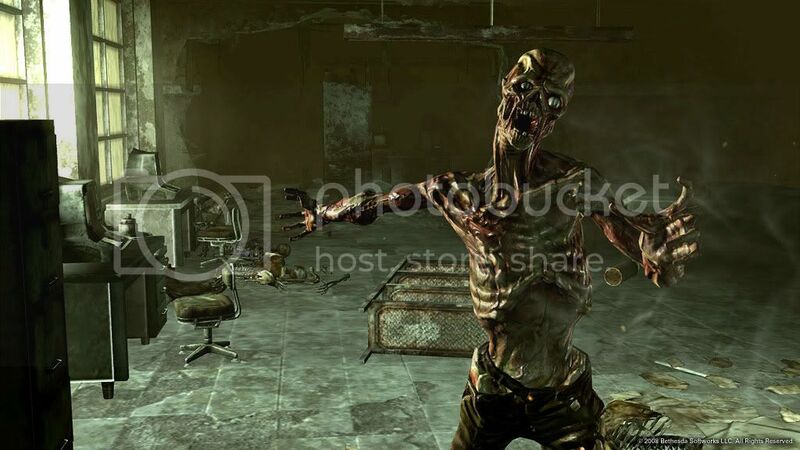 It has been noticed from time to time that VATS may not function correctly. Simple exit VATS and save your game. Exit to the main menu and Load the last saved game. Pick up exactly where you let off. VATS will work after the game is reloaded. On lower capacity video cards (512MB and lower) gameplay may be restricted to about 120 minutes before the game exceeds itâ€™s memory limits and ultimately freezes. If you are unable to close the game, simply click shift+tab and close the game from the dock. Vault 101 â€“ Jewel of the Wastes. For 200 years, Vault 101 has faithfully served the surviving residents of Washington DC and its environs, now known as the Capital Wasteland. Though the global atomic war of 2077 left the US all but destroyed, the residents of Vault 101 enjoy a life free from the constant stress of the outside world. Giant Insects, Raiders, Slavers, and yes, even Super Mutants are all no match for superior Vault-Tec engineering. Yet one fateful morning, you awake to find that your father has defied the Overseer and left the comfort and security afforded by Vault 101 for reasons unknown. Leaving the only home youâ€™ve ever known, you emerge from the Vault into the harsh Wasteland sun to search for your father, and the truth. Experience S.P.E.C.I.A.L.! â€“ Vault-Tec engineers bring you the latest in human ability simulation â€“ the SPECIAL Character System! Utilizing new breakthroughs in points-based ability representation, SPECIAL affords unlimited customization of your character. Also included are dozens of unique skills and perks to choose from, each with a dazzling variety of effects! Fantastic New Views! â€“ The wizards at Vault-Tec have done it again! No longer constrained to just one view, experience the world from 1st or 3rd person perspective. Customize your view with the touch of a button! Blast â€˜Em Away With V.A.T.S.! â€“ Even the odds in combat with the Vault-Tec Assisted Targeting System for your Pip-Boy Model 3000! V.A.T.S. allows you to pause time in combat, target specific body parts on your target, queue up attacks, and let Vault-Tec take out your aggression for you. Rain death and destruction in an all-new cinematic presentation. Mind-Blowing Artificial Intelligence! â€“ At Vault-Tec, we realize that the key to reviving civilization after a global nuclear war is people. Our best minds pooled their efforts to produce an advanced version of Radiant AI, Americaâ€™s First Choice in Human Interaction Simulation. Facial expressions, gestures, unique dialog, and lifelike behavior are brought together with stunning results by the latest in Vault-Tec technology. This update includes two wrappers. The first is configured to run the Vanilla version of Fallout 3 Game of the Year Edition. The second is configured to run the same version but is completely set up to start modding the game. Both wrappers utilize Wineskin 2.6.2 with the Wine Staging 1.9.1 engine. Staging features are enabled. To try the wrappers with the features disabled use Wineskin > Advanced > Tools > WineCfg > Staging and uncheck all available options. The Mod ready version has separate launchers for each respective utility necessary to mod the game correctly. If you choose to download the mod ready version and are not totally sure how to begin, a really great Windows tutorial is available by click the link below. All of the preliminary steps have been undertaken but the installation instructions must be followed correctly in order to obtain the best results. Scroll down half way down the tutorial to the section titled Biased Mod Recommentations & Setup Tips CASM has already been installed into the mod ready ready version. If the utility launchers and Fallout.3-Mod.Manager.app are removed from the main folder, or if any of them are renamed; they will not work correctly. 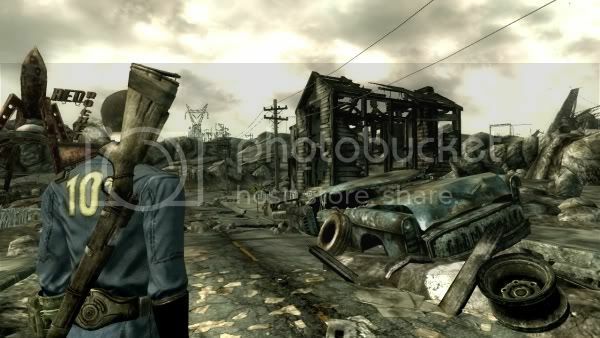 The mod ready version of the wrapper is much larger than that of the vanilla Fallout 3 wrapper due to dependencies required by the utility apps and files installed that required. Mod ready version installation instructions need to be followed to obtain the best results. This wrapper utilizes Wineskin 2.6 with a WS9WineCX14.1.3 engine. Microsoft dot net 2.0 is a Mod Manager dependency and has been installed. Other dependencies installed through Winetricks include devenum, mfc42, msxml3, vcrun2008, d3dx9, remove_mono, fontfix, vcrun2005. Although this wrapper includes an engine build using CrossOver, it is highly recommended to download Wineskin Winery and update the app by adding available engines directly from the Wineskin servers into Winery. Then use Wineskin to swap out the engines that youâ€™ve downloaded. If you had a previous version of Fallout 3 installed on your system it is suggested that you delete the .ini files located in your Home > Your User ID > Documents > My Games > Fallout3 folder. When Fallout.3-Launcher is run, the game will detect the level of detail specific to your system. Although it may be possible to incurease your level of detail depending on your system specifications. Exampleâ€¦Fallout 3 detects that my system can only handle a low detail setting, however when settings are increased to medium and high the game still runs at an acceptable frame rates. Do not launch any applications in the Fallout.3 folder before the game is installed. The folder contents includes a folder containing files that are beneficial to the installation process for best performance and ease of modding. The files in this folder are intended to be installed after the game has been installed are explained in the install instructions. The Fallout.3 folder also includes three applications, and an archived application. The three applications are Fallout.3-Game.Of.The.Year.Edition.app which already contains all of the files necessary to run the game aside from the contents of the Data folder which accounts for over 9.5GB of game files, Fallout.3-Launcher.app and Fallout.3-Mod.Manager.app. The first application contains the main installation directory and mod files. It is configured to run fose_loader.exe. This is required to run certain scripts that are required during the modding and gameplay process. 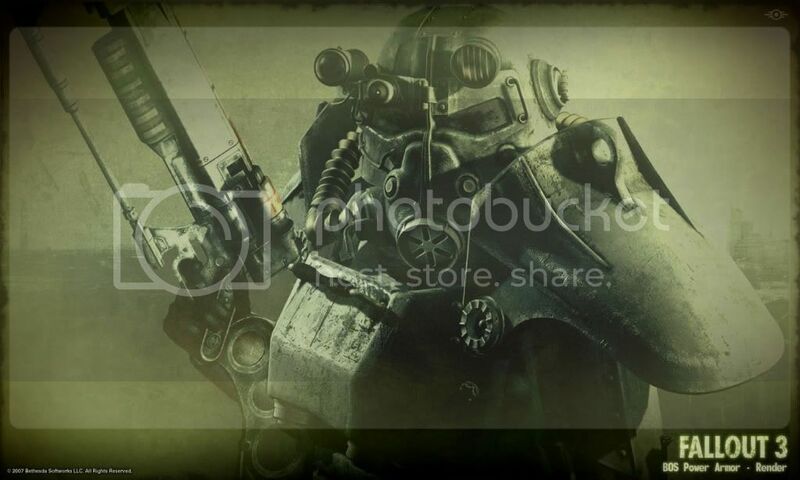 This is the application to use if you intend to mod your version of Fallout 3. The next applications are symlinked back to main game directory and rely on Fallout.3-Game.Of.The.Of.The.Year.Edition.app. to run correctly. If they are removed from the folder the symlinked pathway to the drive_c folder and Frameworks folder will be broken. Fallout.3-Launcher is the first application that should be launched, which will create configurations files located outside of the wrapper in your Home/***/Documents/My Games/Fallout3 folder. 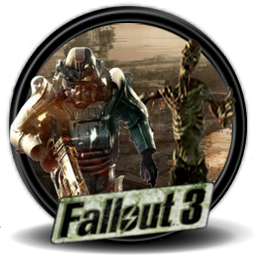 The Fallout.3-Mod.Manager.app is the app that will be used to install the Mods, if you so choose to do so. Both are explained in further detail below in the installation instructions. Two mods have been added into the Post Install Files folder. The Alternative Start mod and the Fellout Mod. The alternative Start mod will bypass the introduction scenes after the main character has been created. This will bring you directly into the Wasteland immediately after birth. Fellout is an environment mod and removes the green hue built into the environments through the game and all DLCâ€™s and creates a more vibrant Wasteland in both interior and exterior backdrops. Drag and drop the contents of the Data folder from the installation wrapper located at Program Files/Bethesda Softworks/Fallout 3 Game of the Year Edition/ into the Data folder of the database wrapper located at the same pathway. When all files have been placed into the wrapper Use Wineskin > Install Software to install the patch into the game. Close the Window and double click to launch the game. If the Mod ready version was chosen, double click the individual utility apps to launch the corresponding programs. Once the game has loaded to the main menu you can choose to play without any mods and continue from here into the Wasteland. If you are having issues running this game on an Intel HD4000, the following instruction may help. Having the same problem as he is now. After the G4WL fix, I was able to proceed until I exit the vault. At about 3 to 30 or so seconds in, the game freezes. Hey everyone, I had gotten my fallout 3 working and I'm running a Intel HD 4000 graphics card on mountain lion 10.8.4. I may be missing some things, but those are ALL of the things I did to get mine working. Do them all in logical chronological manner, then individual if that still doesn't work. I'm not really sure why it would be crashing right after exiting the vault. The only thing I can think of is the fact that the video memory is not functioning correctly. Try dropping the graphics setting all the way down then exit the vault....if that works, slowly increase graphics settings until it starts crashing again. As for disabling the .Net 3.5 you can go into the Wineskin settings and choose Uninstaller under Advanced/Tools Dot Net will be in the list of installed programs and you simply have to click Remove and it will uninstall. However if you do choose this road then you will not be able to use the mod manager of the script extender as they both rely on it to work correctly. Losing hope I attempted deathnotex101's fix and same thing happened -- crashed a few seconds after exiting the vault. Then, for some reason, I thought starting a new game might fix it... and IT DID! I deleted the saves AND the .ini (the .ini in the same directory as the save folder) and every other file in that location and started a new game which allowed Fallout to reconfigure the settings. I think the solution is to make sure Fallout doesn't read your computer specs BEFORE you apply the fixes. It should configure after you've applied the fixes. That's what I think though. Haven't replied all that much because I've been too busy with the Wasteland. The wrapper has the game installed but it has never been launched on any system. For testing purposes the wrapper was copied and then tested but the wrapper mounted on the disk image has never been launched. The Mod Manager app is sym linked to the main Fallout 3 wrapper. The program files for the Fallout Mod Manager are located inside the Fallout 3 wrapper therefore if the Fallout Mod Manager app is removed from the main folder the application will not performing correctly. This game has become increasingly compatible with Wine over the years and performance is at an unprecedented high. The GOTY version of this game has been tested extensively with over 55 different mods installed and activated at the same time. Granted, for best performance some of the higher end graphics need to be compromised but with specific settings depending on the graphics processing available to the system, the game can run run at a beautiful frame rate with enhanced graphics. Slight hints of graphics artifacts occurring although they only last a fraction of a second and do not occur often giveen a near zero impact to gaming enjoyment. With .Net 2.0 installed no issues are present. This updated wrapper has quite a few changes made to it. It utilizes the Mac driver and CXWine12.1.2. The performance is unparalleled to any other wrapper that has been tested on this machine. I have also included an add ons package that includes fixes and the unofficial patch. See install instructional video for further details. This wrapper is configured to use fose_loader.exe to launch Fallout 3 so it is imperative to either install the add ons, specifically the Fallout Script Extender files or reconfigure Wineskin to launch the game via Fallout 3.exe. Using the fose loader will enable you to add mods that require scripts to work correctly. Slight graphical artifacts that appear randomly, although they are barely noticeable. Upon launching the mod manager, the app may give you an error, click cancel until the app shuts down the launch it again. I'm not totally sure what is causing this error but closing out the app and relaunching has always proven successful. The intro movie breaks and only a fraction of the screen works during the video. Press escape to continue on to the gameplay. The intro movie is the second youtube video below. When entering into the wasteland the FPS drop slightly. It seems that game play is much more responsive while indoors. - Fixed - Although there is a still a minimal drop in frame rate it's not nearly as appearant as it was in previous wrappers. The Offscreen Rendering Mode has been set to "backbuffer" to rectify a slight graphical glitch on my system. The issue arises when you go to create your characters facial features. "backbuffer" causes the Gene Projection interface to break. If this is an issue for you, it is possible that the "fbo" setting may prove for better performance on other systems. To change this simply hold down the alt/option key while double clicking the Fallout_3.app. This will launch Wineskin, Click Advanced/Tools and then click on Winetricks. When Winetricks launches click on the settings dropdown box and scroll down until you see "orm"="fbo"....check the box next to it and click Run...then, OK This will change the setting to fbo. 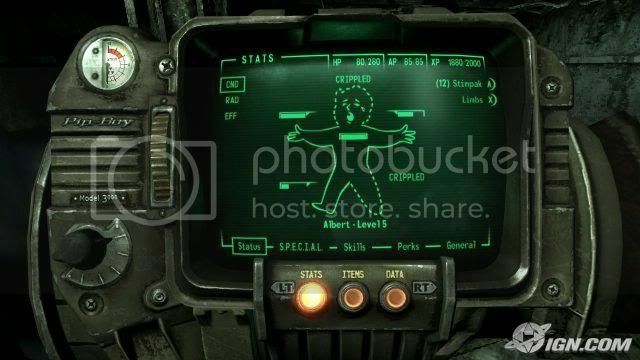 After you have completed you Gene Projection save the game and then reset "orm"="backbuffer" if you notice grapical corruption from "fbo"
In order to avoid crashes in the game the fallout_default.ini file must be placed in the Fallout 3Fallout_3.app/Contents/Resources/drive_c/Program Files/Bethesda Softworks/Fallout 3 prior to the first launch. This mod will enable ironsights to be used in the game with a number of weapons. 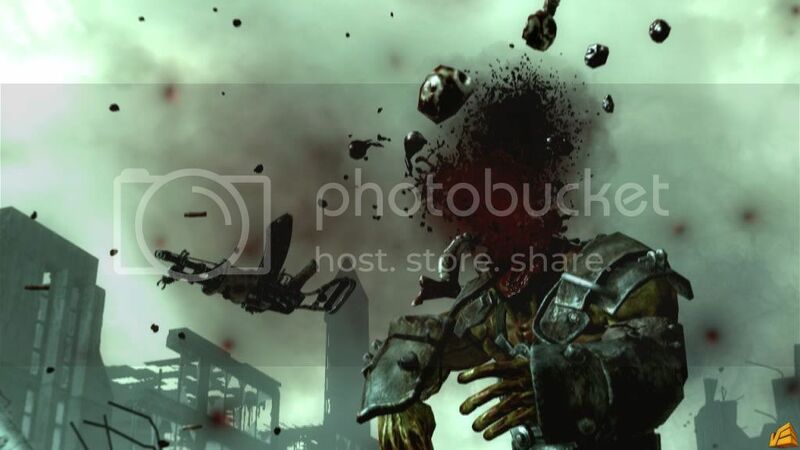 Drag and drop the contents of the RH_Ironsights/Data folder to Fallout 3/Fallout_3.app/Contents/Resources/drive_c/Program Files/Bethesda Softworks/Fallout 3/Data. This mod changes the hue of the environment from the irradiated green glow that is synonymous with Fallout 3 and gives it a more realistic tone. Double click the Fallout_Mod_Manager.app to launch the mod manager. It should recognize the files that were just placed in the Data folder of the games directory. Check all of the unchecked boxes in the Mod Manager and then close the app out. If you have a current install of Fallout 3 go to HOME/YourUserName/Documents/My Games and remove the Fallout3 folder and place it on your desktop. This is the location of the save files and some configurations files that [i]fallout_default.ini will configure upon launch. This is the first file that was placed in the game from the add ons folder. On first launch the Fallout Launcher should appear and give you a message that it is going to set system settings based on your rig. Click OK and allow it to do this. Now click on the options and reset the settings to an appropriate level for enjoyable gameplay. Example X1600 w/ 128MB vRAM gets set at medium, although this looks great performance takes a hit, in lowering the specs to low the performance is spot on. Higher end systems ned not worry about this step. Fallout 3 takes place in the year 2277, 36 years after the setting of Fallout 2 and 200 years after the nuclear apocalypse that devastated the game's world in a future where international conflicts culminated in a Sino-American war in the second half of the 21st century. The game places the player in the role of an inhabitant of Vault 101, a survival shelter the size of a village, designed to protect a small number of humans from the nuclear fallout. When the player's character's father disappears under mysterious circumstances, he or she is forced to escape from the Vault and journey into the ruins o Washington D.C. to track him down. 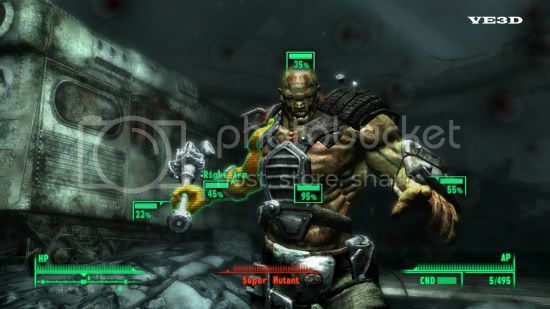 Along the way the player is assisted by a number of human survivors and must battle a myriad of enemies that now inhabit the area now known as the "Capital Wasteland". 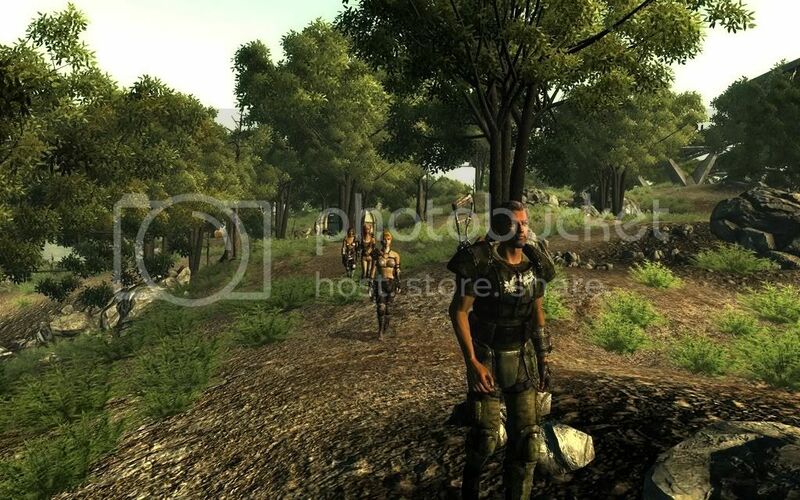 The game has an attribute and combat system typical of an action strategygame but also incorporates elements of first person shooter and survival horror games. The previous releases of this game have been (although not at the time) in outdated versions of wineskin and due to advancement in the OS X Open GL drivers and doh123's updates to WS3, this game is playing closer to 40 FPS in ideal locations. It has a Platinum rating at the AppDB, here it gets green! So go ahead and download this WS8 updated wrapper. I used the currently available F3 wrapper by Thanoulas and modified it quite a bit. I was getting a constant crash when trying to open the door to Vault 101 Atrium. After some rigging around with the registry and installing a couple of winetricks I was able to get this working like a charm on my system. Currently installed engine is WS8DZWine1.3.12d, I'm not sure exactly what Wine tricks Thanoulas installed in the wrapper but the mouse no longer works with my WS8Wine1.3.18_F3 so I left his patched engine in there which works well (but neither as well as 1.4 would) If for some reason you change the engine of the wrapper you can find an archived copy of the Wineskin engine in the Contents folder of the wrapper (Right click and choose "Show package contents") Extract the engine and place it in the Contents > Frameworks folder. Right click on the wrapper and choose 'Show Package Contents"
close the windows out and double click the Fallout 3.app to launch the game. The Wineskin installer can be used to install the game but it may change the System.reg entries and the executable pathway may require to be changed. When entering into the wasteland the FPS drop slightly. It seems that gameplay is much more responsive while indoors. Install Fallout 3 with the CX installer/Crossover/Parallels/ or Windows and drag and drop the contents of the Fallout 3 game files folder to Package Contents > Contents > Resources > drive_c > Program Files > Bathesda Softworks > Fallout 3. I have included the xlive.dll inside the program files > bathesda softworks > fallout 3 folder to make it easier to install, this file is required, do not overwrite or delete. Patched quartz/pin.c to fix the lack of in game music. Music files now work. Simply drag and drop an existing Fallout 3 installation ("Bethesda Softworks", in "Program Files") to the corresponding folder within the wrapper. If you are using an ISO, mount it and use "Install Windows Software" from the Wineskin app in the wrapper to install. First-time users of a non-Steam copy MUST run the "Launcher" app within the wrapper in order to configure their video card settings. If you are using Steam, rename "Fallout 3" to "Fallout3" and install Steam using Winetricks, then install the game from your account as needed. Ãƒâ€šÃ¢ Don't forget any NO-CD cracks! Save early, save often. Crashes can and will happen; some of them are my fault, some of them Wine's. The rest you can blame on the addictive yet buggy game itself. Crashes? Ãƒâ€šÃ¢ "A serious error?" Ãƒâ€šÃ¢ First, restart your Mac and try again. Ãƒâ€šÃ¢ Afterwards, lower your graphics settings. Ãƒâ€šÃ¢ Still not working? Run the game in Debug Mode (below) and post it to pastie.org. Includes a Windows Live Disabler; in other words, no DLC. Ãƒâ€šÃ¢ There are mods to hack "LIVE" out of the main menu. Includes Fallout Mod Manager, or FOMM. Ãƒâ€šÃ¢ Launch it from within the wrapper. Getting an "Application Load Error"? Ãƒâ€šÃ¢ You downloaded a pirated version and didn't crack it. Ãƒâ€šÃ¢ Nice job, try again. Crappy performance? Ãƒâ€šÃ¢ Make sure you are using the latest wrapper as well as the latest title (1.7 at time of writing). Ãƒâ€šÃ¢ If you have the Steam version, just launch Steam and have it automatically update. Ãƒâ€šÃ¢ If you have a boxed or cracked GOTY edition, the latest update is included. All DLC is pre-activated; if you aren't a modder, just add the correct files and play. Running in Debug Mode: Control-click "New Vegas", hit "Show Package Contents." Ãƒâ€šÃ¢ Run Wineskin, hit Advanced, and run Debug Mode via the middle-bottom button. Make the following change to FALLOUT.INI (~/Documents/My Games/Fallout3) once you run NV for the first time (as long as you have at least a dual-core processor): Change bUseThreadedAI=0 to =1, and add a line beneath that reads iNumHWThreads=2 (2 being the number of processor cores you have). Based on Wine 1.3.12 (Git 20110203) and Wineskin 2.0 RC 2. 1.1 (3 Feb 2011): First public release. Ãƒâ€šÃ¢ Minor framerate jump. Ãƒâ€šÃ¢ Fixes crash bug. 1.0 (30 Jan 2011): Ãƒâ€šÃ¢ Based on 2.0 of my NV wrapper. Ãƒâ€šÃ¢ Wine Ãƒâ€šÃ¢ 1.3.12, some of MS DirectX. Ãƒâ€šÃ¢ FOMM included. Thanks to DankoB asking me to post it in this topic. I feel like such an interloper. :D/> It works extremely nicely! I have included the xlive.dll inside the program files > bathesda softworks > fallout 3 folder to make it easier to installÃƒÂ¢Ã¢â€šÂ¬Ã‚Â¦this file is required, do not overwrite or delete. is there a reason the Wineskin Installer doesn't work? Think this'll fix my securom problem? I have goty edition on cd but I didn't install any of the "addons" from the 2nd disk. Is a direct Download Possible? Because my ISP curbs torrent traffic horrifically. And I mean HORRIFICALLY. Like 1.2KB/s on a 8MB/s internet connection. Does it need to be 1.7.01? I have an older version (not GOTY, but I do have the DLC installed). Should I update it? Have you tried turning on encryption? Most Bittorrent programs have that option. It doesn't prevent you from getting caught by the law (because your IP address may be still logged with the tracker/peers), but it usually prevents the ISPs from "traffic shaping", i.e. throttling down torrents. Also, this particular torrent is just slow anyway right now. and @ trainik....the wrapper should work with any version, I just happened to be able to install it to the most recent update. I've still got the crashing in the wasteland, anyone else? What do you have your advanced graphics set to tcrown? Maybe lowering the settings will allow it to play without crashing. I've tried low medium and high doesn't seem to matter where they are after a certain amount of time usually 30mins or so, it will crash without fail. According to Winehq there is a memory leak problem that seems to affect fallout and some source games. I would be curious to hear what others experiences are? Just for Fun an Selfmade icon! ..and thanks for that icon, I think I will use it...what did you use to make the icon?